The Long Suffering Husband is a sucker for small children selling sweets door-to-door to support the Little League, the class field trip, the Infant Hackers Society. He says it is empathy from having been forced to sell stuff as a kid, back in the days when your Mommy did not accompany you onto the mean streets of the ‘hood. I think it’s all about the caramel corn. There is something very strange about commercial caramel corn. Have you noticed how each piece has almost exactly the same rounded, puffy shape? It must be a genetically modified Frankencorn, developed to look pretty. It is fairly tasteless, and serves primarily as a vehicle for the caramel. Which is irresistible: crunchy, slightly salty, and sweet. 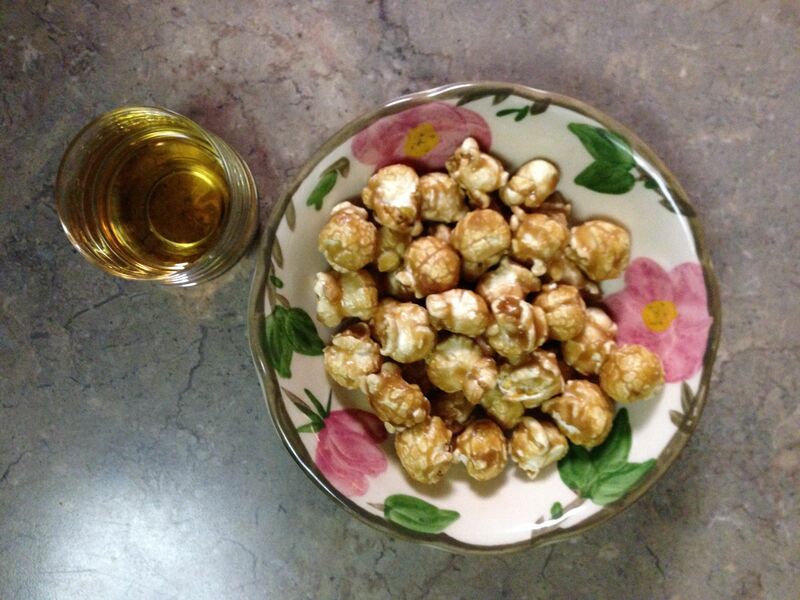 I discovered by accident that caramel corn is a perfect companion for Jameson’s Irish Whiskey. Usually my evening tipple is Rémy-Martin, but lately I’ve been drinking Jameson’s. I expected it to taste like Scotch, but it’s lighter and (don’t tell the lads) more feminine. A very enjoyable elixir, with its own hints of honey and caramelized barley. The Infant Hacker may come round again, but at $10 a tin, I suppose I had better try making my own. OMG, that sounds incredible! I’ll have to try something along those lines. It would be excellent over green veggies. I imagine that any whiskey would work, but it would be a shame to waste a single malt on a sauce like this. JD would be just fine! My absolute favorite is kettle corn. I love that mixture of salty and sweet. Yes, and not overly sweet. Perfect. Yeah, it would be a reasonable guess that I discovered Jameson’s whilst in Ireland, but I first tried it when a friend here offered some! I was surprised at how different from Scotch it is. Most Scotches, any way. Yes, and we mustn’t forget “Writer’s Tears”! Your own homemade caramel corn with Jameson’s won’t prevent LSH from door-to-door support but it’s likely to result in his choosing other items. Yes, isn’t he? I like this word “sweetchops”! Linnet’s Sweetchop Caramel Corn. I think it would sell big. It’s a goodie, no idea where it came from but the use is many and varied. Great for cute and thoughtful menfolk, gorgeous babies and fuzzy animal folk. Carmel corn is my all together favorite!